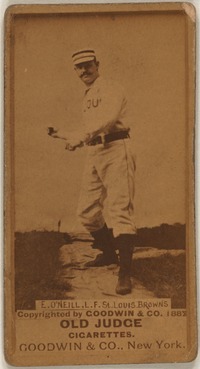 O’NEILL, JAMES EDWARD (Tip), baseball player and restaurateur; b. 25 May 1858 in Woodstock, Upper Canada, son of James O’Neill, an innkeeper, and Mary Jeffrey; d. unmarried 31 Dec. 1915 in Montreal and was buried 3 Jan. 1916 in Woodstock. 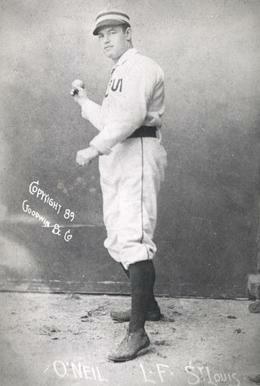 James O’Neill first played organized baseball in his home town. 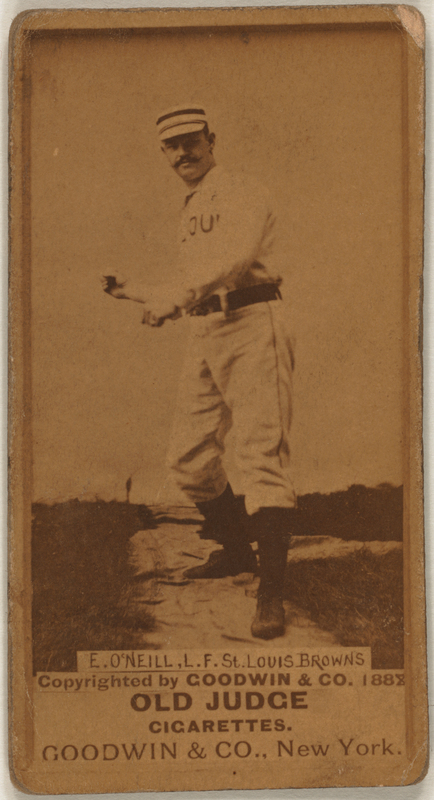 In 1883 he joined the American major leagues, in which he would play for about ten years. He signed his first contract as a pitcher for the New York Giants of the National League and ended the season with 5 wins and 12 losses. In 1884 he played with the St Louis Browns of the American Association. He pitched in 17 games, with 11 wins and 4 losses, and an earned-run average of 2.68. This was his last season as a pitcher, for he would also play 61 games in the outfield. The 1887 season was an exceptional one for O’Neill. He led the league in runs scored, hits, doubles, and home runs, to say nothing of his batting average. In 1888 he was the batting champion with a .335 average. He helped his team win four consecutive league championships from 1885 to 1888. 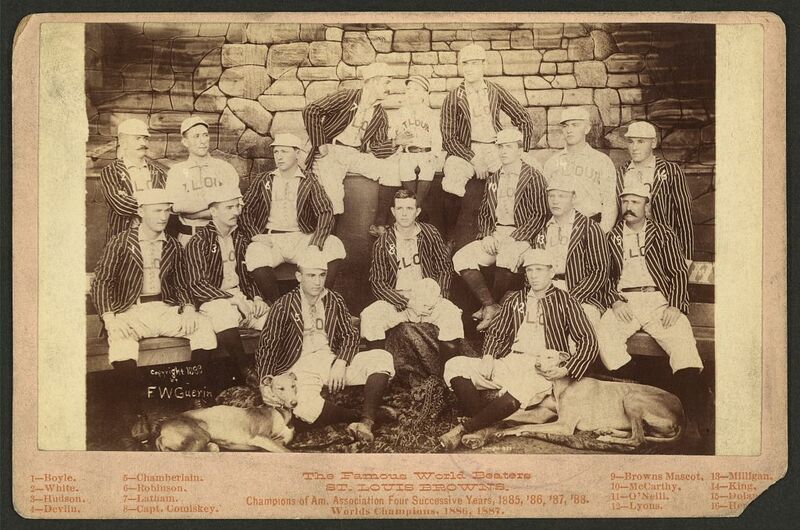 An annual world series from 1884 to 1890 pitted the National League against the American Association. St Louis tied the 1885 series against the Chicago White Stockings with three wins, three losses, and one tie, won four games to two against the same club in 1886, and lost the other two series, one against the Detroit Wolverines in 1887 (five wins, ten losses) and one against the New York Giants in 1888 (four wins, six losses). In 1890 O’Neill signed a contract with the Chicago Pirates of the Players’ League. This league had been created by the players as a protest against the owners of the two major leagues. It lasted only one season and O’Neill returned to the St Louis Browns for 1891. When the American Association broke up at the beginning of the 1892 season, O’Neill went to the Cincinnati Reds of the National League; at the end of that season he retired. A few years later O’Neill was in Montreal, where he helped to get the Royals started in 1898. His brother George A. O’Neill was the first president of this Eastern League professional team. Tip continued to be active in baseball in Montreal, working as an umpire or playing on such teams as the Montreal Reserves of the Canadian Baseball League in 1907. He had business interests as well. When his brother died in 1909, he became proprietor of the Hoffman Café on Rue Notre-Dame. As he was getting off a streetcar at the corner of Rue de Bleury and Rue Sainte-Catherine on 31 Dec. 1915 he succumbed to a heart attack. James O’Neill holds a generally recognized major-league baseball record for the highest batting average in one season, but he has never been named to the American shrine, the National Baseball Hall of Fame and Museum, in Cooperstown, N.Y. He was elected to the Canadian Baseball Hall of Fame and Museum in 1983 and Canada’s Sports Hall of Fame in 1994. AO, F 977, St Mary’s Roman Catholic Church Cemetery (Woodstock, Ont. ), sect.a, lots N35, Q30; RG 22-317, reg.5: 342–43. Daily Sentinel-Review (Woodstock), 3 Jan. 1916. Montreal Daily Star, 17 Nov. 1904, 28 Jan. 1907. La Presse, 3 janv. 1916. Toronto Star, 12 Jan. 1994: A18. Directory, Montreal, 1905–10. Total baseball, ed. John Thorn et al. (3rd ed., New York, 1993). Michel Vigneault, “O’NEILL, JAMES EDWARD,” in Dictionary of Canadian Biography, vol. 14, University of Toronto/Université Laval, 2003–, accessed April 23, 2019, http://www.biographi.ca/en/bio/o_neill_james_edward_14E.html.